Reef Fishing at Night, Samoa by Dorr Bothwell (1929). Woodblock print. Private collection. NOTE: Dorr Bothwell considered the artwork she did in Samoa her finest. From 1928 to 1929 Bothwell produced hundreds of pieces, but our archive has only these few images from that seminal period in her life. If you have other, or better, digital images to share, please contact us. Thank you. …When [Dorr Bothwell’s] family’s fortunes shifted after her father’s unexpected death in 1927 [see Port Gamble], Bothwell was left without funds. She sought then to live cheaply and took odd jobs (waitressing and occasional teaching gigs, for example) but continued to paint and draw. In spring 1928, Bothwell inherited $3,000 from her Auntie Trissie [Bothwell’s Aunt Maria Theresa von Lushcka, who was living in Switzerland at the time of her death], and like generations of artists before and since, the unexpected windfall enabled her to pursue art. 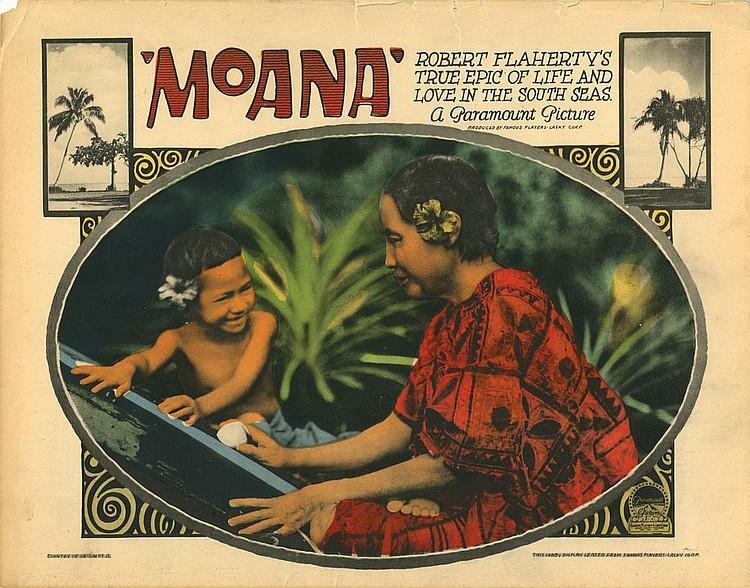 The South Pacific islands had appealed to her after she saw Robert Flaherty’s documentary Moana in early 1926. Poster for Robert Flaherty’s 1926 film Moana. Flaherty’s Moana intrigued and inspired Bothwell. She was captivated by the aesthetics of the silent film, and it also served as a moving-picture field guide to the possibilities of life in the South Seas. It depicted a native Samoan community’s preparations for a major celebration: the rite of passage of the young male protagonist, Moana. 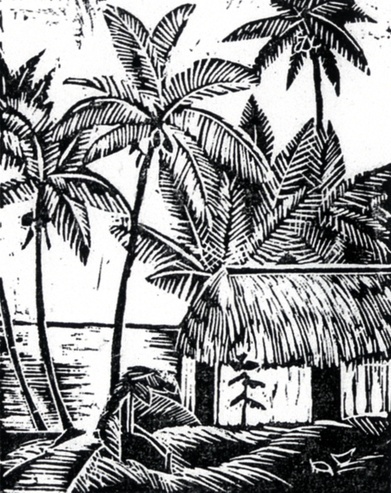 Flaherty included scenes of native men and women—including elders and children—hunting wild boar; spearfishing; capturing giant turtles and clams; and foraging for taro and nuts. Men danced and cheered for Moana; women prepared custards and breadfruits, and made barkcloth garments for him. 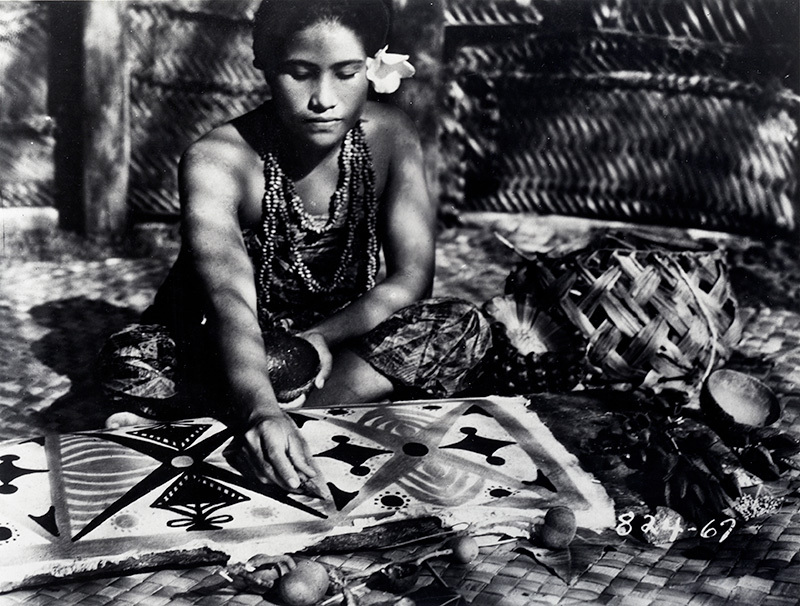 Young woman painting tapa cloth, a still from Robert Flaherty’s 1926 film Moana. The rite culminated in a painful ritual: Moana, anointed by his maiden lover, Fa’angase, was tattooed during a lengthy ceremony by artists using tiny hammers. In 1928—with Samoa as her destination and her legacy in hand—she quit her part-time job as a waitress at Ingersoll Candy Company in San Diego and prepared to sail. 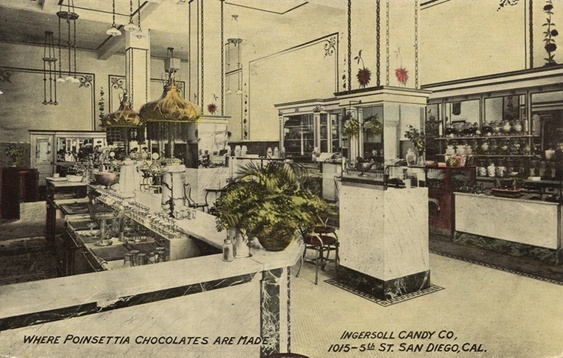 Ingersoll Candy Company and Restaurant (“Where Poinsettia Chocolates are Made”), 1015 5th Street, San Diego, California (circa 1928), where Dorr Bothwell worked as a waitress after her father’s death. [Bothwell noted] in her diary: I have 11 yds of the finest belgiuim linen canvas + oodles ($35) of paint. All I hope is that living will be cheap enough so that I can stay long enough to get some work done. What I would like is to be adopted by a native family + live with them so that I get the native food, a chance to learn their language + study their songs + dances etc. Divine [undecipherable] governs so I will find my proper place. Having appropriated a dust-proof, air-tight trunk belonging to her mother’s Chevrolet coupe, on her twenty-sixth birthday [May 3, 1928] Bothwell carried a roll of canvas, stretcher bars, and paints to her second-class cabin aboard the S.S. Sierra and set off for Pago Pago. With her own work in mind as well, Bothwell devised a plan: Had a bright + brilliant idea—think that I’ll pretend that I am going to ‘art school.’ Will fix out a varied schedule—such as drawing 3 times a week in the afternoons from 1–4—Painting all day 3 times a week + in the forenoons that are left over I can either write, sketch or do my laundry, wood blocks, etc. In My Room (Samoa) by Dorr Bothwell (1928). Water media. Private collection. 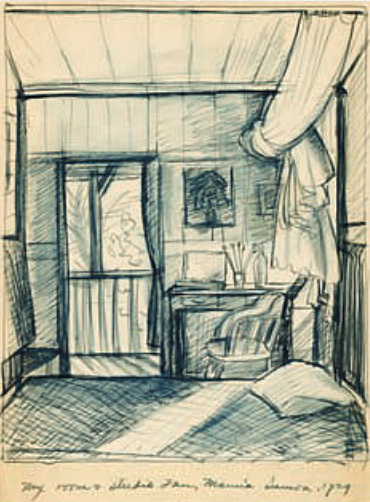 My Room + Studio, Tau, Manu’a, Samoa by Dorr Bothwell (2 May 1929). Drawing. Collection of the Bernice Pauahi Bishop Museum, Honolulu. 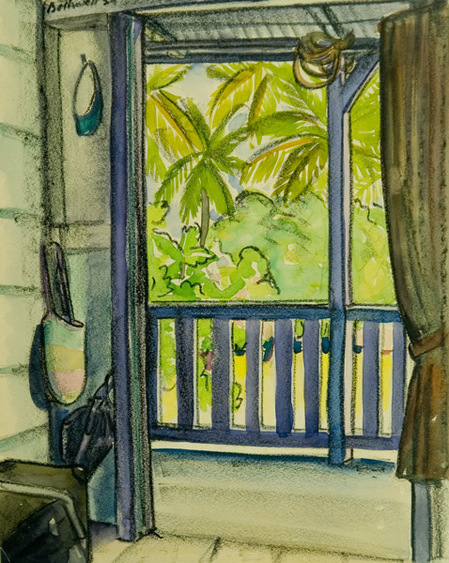 Bothwell was very productive in Samoa, [painting] portraits, landscapes, figure studies, and abstract compositions [and making] numerous studies of everyday life in pen, pencil, crayon, wood-block prints, and watercolor. 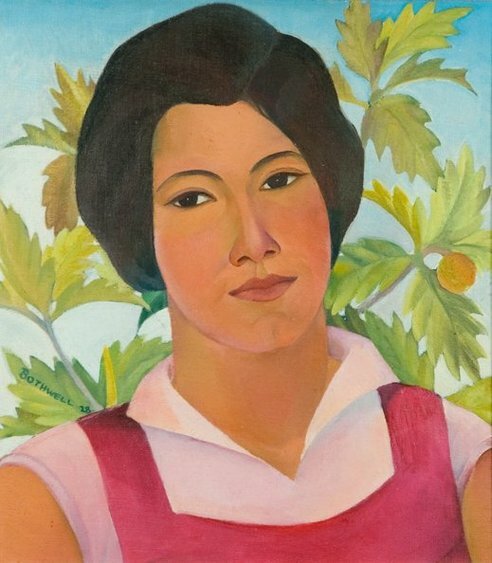 Annie by Dorr Bothwell (Samoa 1928). Oil on board. Private collection. [Bothwell] made dozens of studies of botanicals like hibiscus and frangipani as well as portraits of Samoan friends and neighbors. She continued working on several series that she had developed in the United States, including a portrait of her family from 1909, and began new ones. 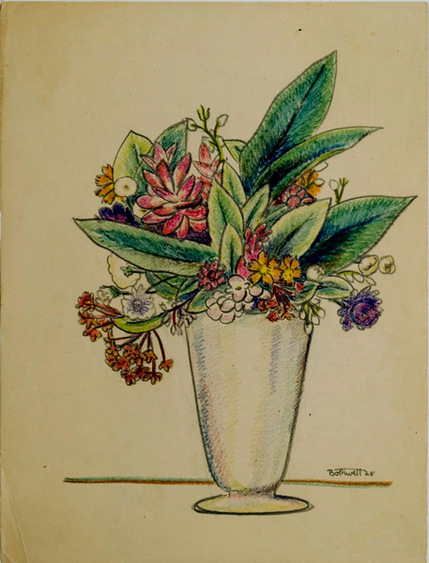 Tropical Flowers by Dorr Bothwell (Samoa 1928). Drawing. Private collection. 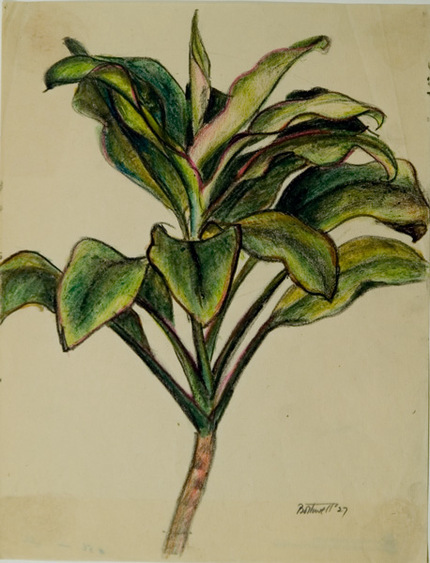 Ti Plant by Dorr Bothwell (Samoa 1929). Drawing. Private collection. 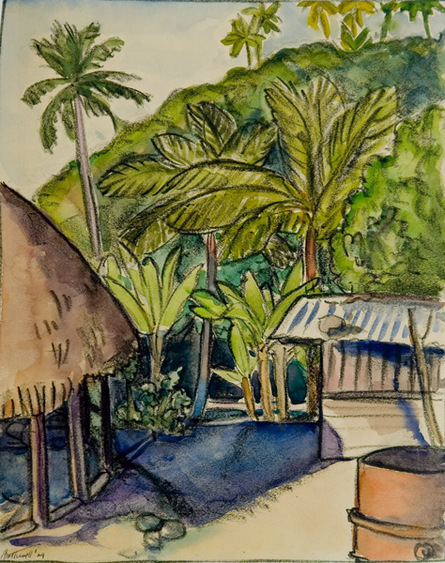 Tau, Samoa by Dorr Bothwell (1928). Ink on paper. Private collection. 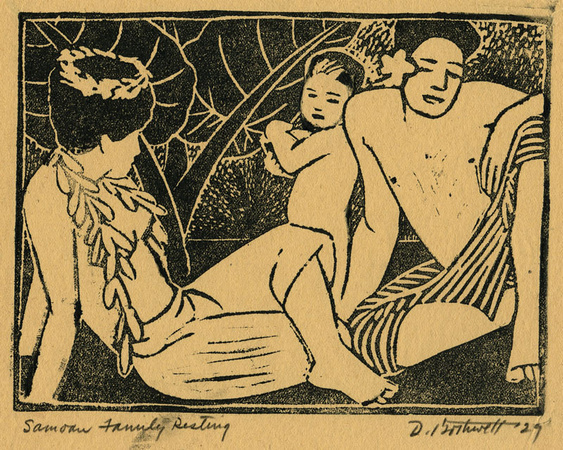 In the village on Ta`ū by Dorr Bothwell (1929). Water media. Private collection. Meeting House by Dorr Bothwell (Samoa 1929). Water media. Private collection. Six months into her stay, she sent to her mother for her camera equipment, and once she received it, she snapped rolls of film and processed and printed images in a makeshift darkroom at a friend’s house. Remarkably, despite being on a remote island, Bothwell also kept her hand in at home. She entered contests sponsored by magazines like Life and sent pictures through the mail for her mother and San Diego gallery director Reginald Poland to sell. 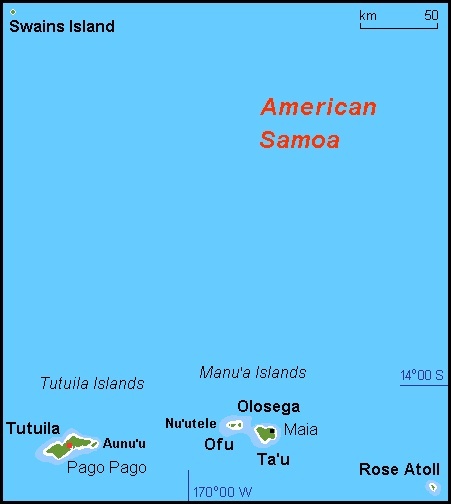 The profits enabled her to extend her stay in the Polynesian archipelago to nearly two years. 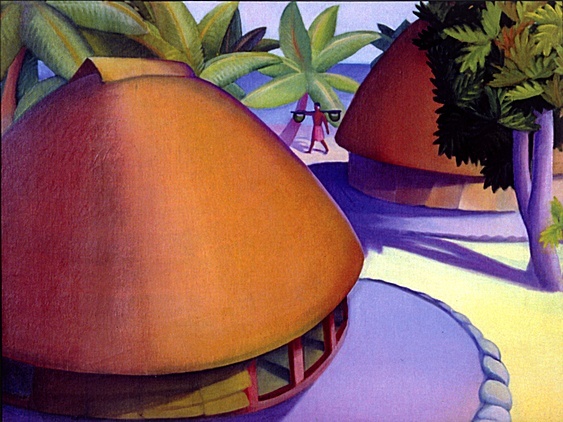 Samoan Houses by Dorr Bothwell (1929). Oil on canvas. Private collection. 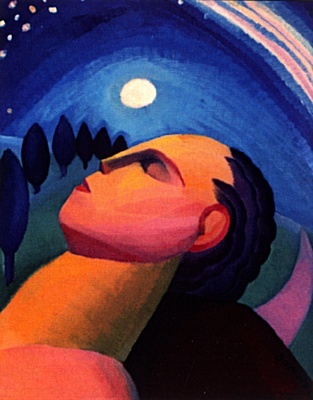 Dreamer by Dorr Bothwell (Samoa 1929). Private collection. During her time in the South Pacific, Bothwell recorded activities in a pair of diaries, sharing impressions, reporting gossip, and preserving the personal musings of a single woman in an extended period of self-examination. Dorr Bothwell: Self-Portrait (1929). Photocopy of drawing. Archives of American Art. Routinely, she noted her experiences dancing, singing, cooking, baking, eating, swimming, gardening, sketching, reading, and praying. Samoan Oven, Ta`ū by Dorr Bothwell (Samoa 1928). Pastel. Private collection. 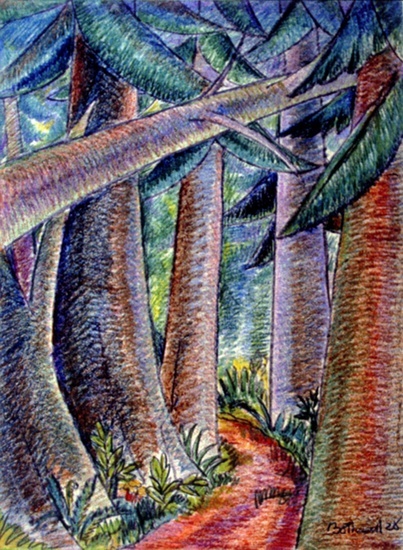 A Path in the Woods by Dorr Bothwell (Samoa 1928). Oil pastels. Private collection. She wrote about her work and efforts to generate money, made notes about the exotic world around her, and marked episodes of ennui, uncertainty, and excitement. Living on Ta`ū, she immersed herself in the rituals and customs of Samoan culture. The Samoans have the loveliest skin—smooth + very fine—especially the young girls + boys. They bathe at least twice a day + then rub oil on, especially at night + I suppose that has something to do with the nice texture their coloring defies analysis. They are all colors—but no matter what shade—light or dark—they are stunning against the green foliage of their jungle like hills. When I think of what a sorry sight two hundred white people—country people or that would be were they asked to wear only a lava-lava—my respect for the Samoan from an artistic standpoint at least, goes soaring up. 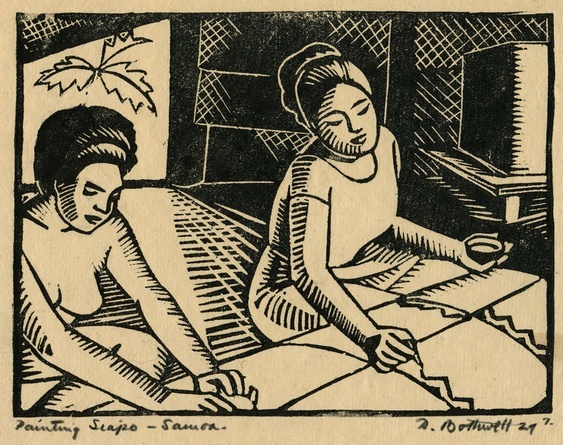 Samoan Family Resting by Dorr Bothwell (Samoa 1929). Woodblock print. Signed D. Bothwell ’29. Private collection. In some entries, Bothwell described Samoans as exotic figures; in others she detailed the lives of individual men, women, and children. Fanfanua. 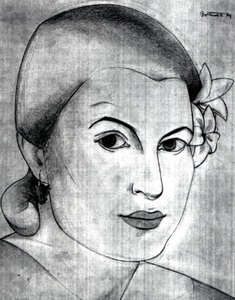 Portrait by Dorr Bothwell (Samoa 1929). Conte on paper. Private collection. Waiting by Dorr Bothwell (Samoa 1928). Private collection. 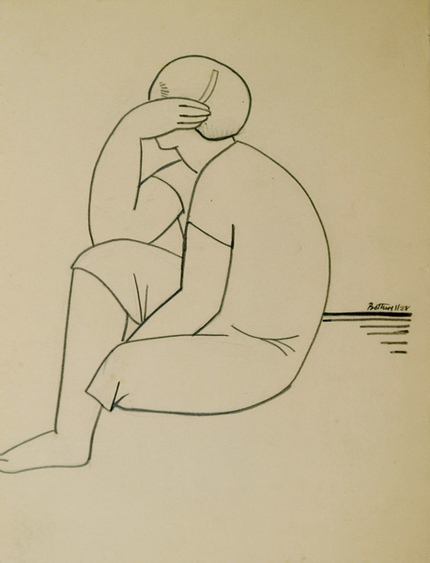 Woman Hiding Her Face by Dorr Bothwell (Samoa 1928). Drawing. Private collection. She was particularly fascinated by Samoan decorative rituals, dances, and material culture. Indeed, within two days of landing on Ta`ū, Bothwell began her study of Samoan women’s traditional handcrafts. 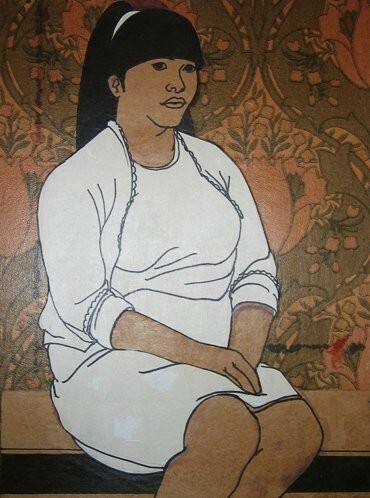 Getting ready to paint a siapo mamanu – Leone Tutuila by Dorr Bothwell (Samoa 1929). Drawing. Collection of the Bishop Museum. Bothwell joined in enthusiastically, as she later explained in her diary, “much to the amusement of about 2 dozen children.” Throughout her daily entries, Bothwell made notes about women and children working with barkcloth. 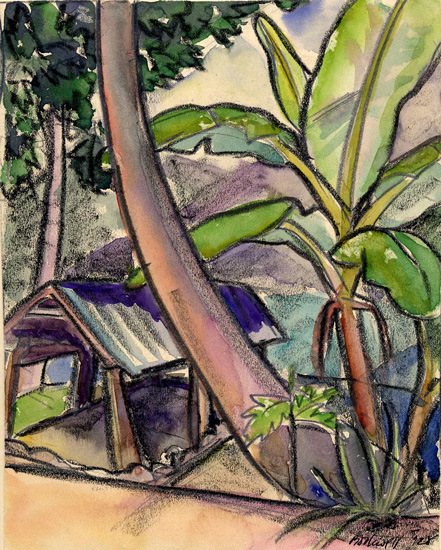 Painting Siapo – Samoa by Dorr Bothwell (1929). Woodblock print (proof 7). Private collection. Bothwell investigated siapo preparations, detailing the local women’s work in her sketchbook in colored pencil, crayon, and watercolor. She researched origins, practices, and customs associated with the paper of mulberry bark on the island. 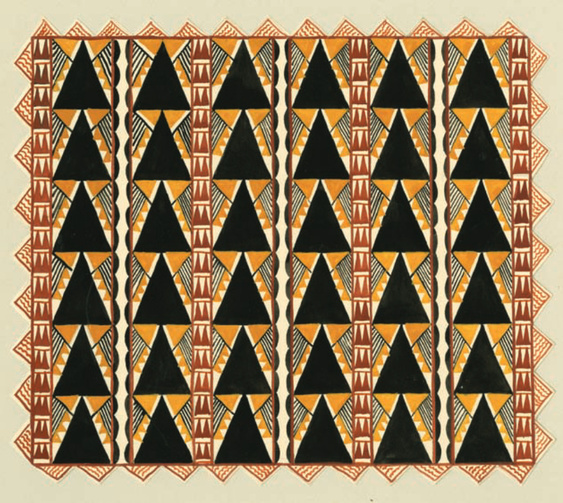 The Samoan artists’ rhythmic patterns shared a design vocabulary of the popular Art Deco style that Bothwell would have known in the United States. 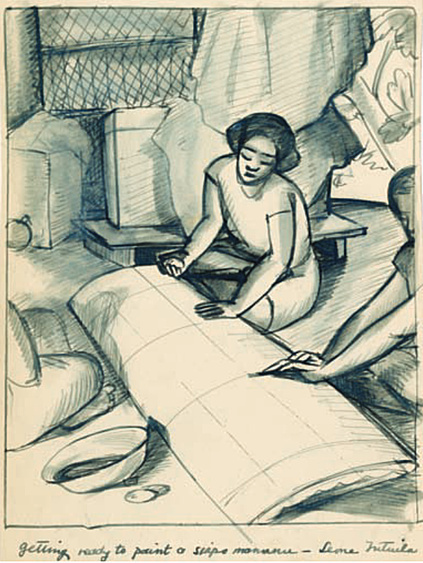 By late September 1928, the industrious and frugal Bothwell developed plans to document Samoan siapo and to capitalize on indigenous art both as a commodity and object of expertise. Collection of 50 tapas to be sold in N.Y. S.F. + L.A.
I’ve started the outline of letter to Macy’s describing in detail this phantom collection of 50 tapas. Will type it off + illustrate it tomorrow. Also got my cartoons for Life [Magazine] ready to send. Gee with all these irons in the fire—something should turn up. 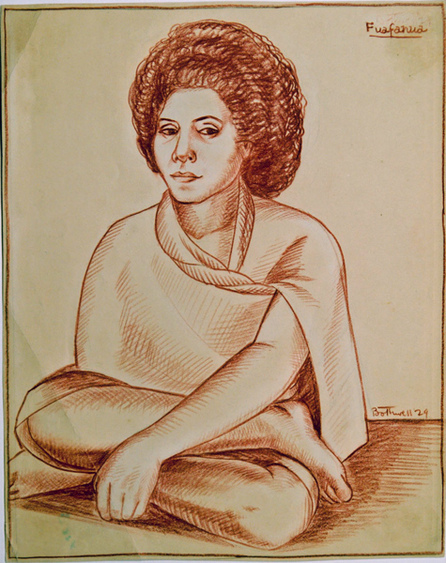 …Bothwell compiled an eleven-page ethnological report, typed up her findings, and prepared seventeen measured drawings in Notes on Modern Samoan Siapo, that she submitted to the Bishop Museum, a natural and cultural history museum and archive in Hawaii. 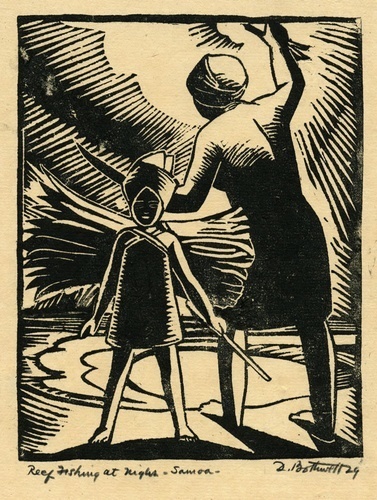 Siapo Mamanu by Dorr Bothwell (Samoa 1929). 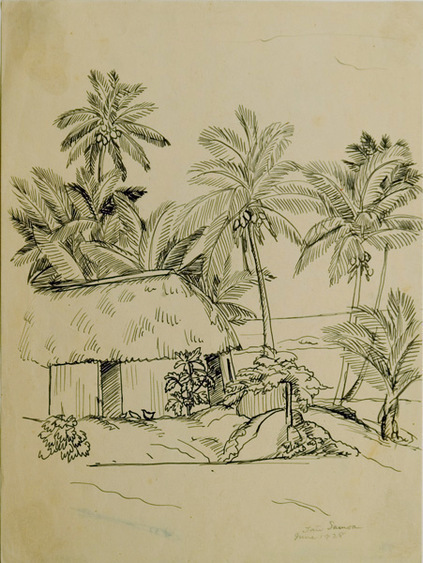 One of a series of seventeen measured siapo mamanu drawings Bothwell made for a report Bothwell submitted to the Bishop Museum. Archives of American Art. Collection of the Bishop Museum. The diaries show how closely involved Bothwell became with Samoans and their culture, to the benefit of her research. Bothwell practiced speaking Samoan, learning vocabulary and vernacular expressions. While she continued to develop her Christian Science faith through reading and work, Bothwell also attended Sunday church services and prayed with local residents. 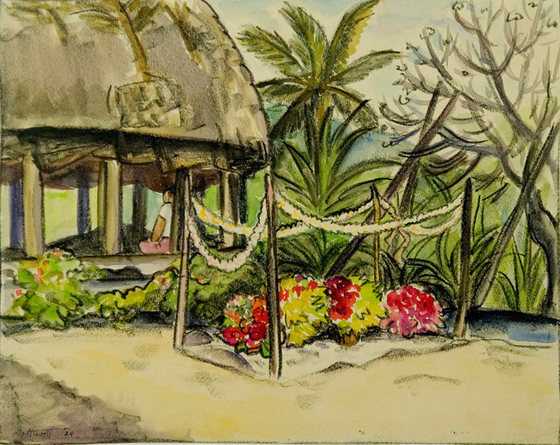 Soon after her arrival on the island, she gained an important entrée into the community when Chief Sotoa, the local chief, bestowed her with “Soaifetu,” an honorific Samoan name [specifically, “the daughter of the chief“]. 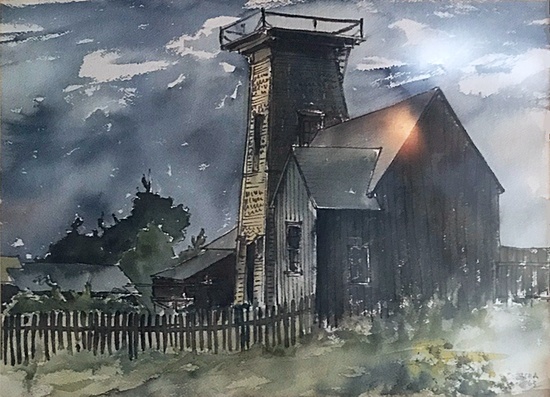 The Village Church, Tau by Dorr Bothwell. Woodblock print. Private Collection. Perhaps the most dramatic example of Bothwell’s experiences was getting a tattoo “foasamoa.” [“Fa’asamoa” can be defined as “in keeping with Samoan cultural traditions,” but more than that, fa’asamoa is an expression of deep Samoan cultural pride]. Read Dorr Bothwell’s description of her tattooing experience. Despite his initial surprise on learning that he was to adorn her, the visiting master tattoo artist, a tufuga, hammered patterned bands onto her upper legs during a four-hour session. The occasion was not the kind of formal, community-wide ceremony featured in Flaherty’s film, but this unusual and painful process ensured that she wore Samoa for the rest of her life. I would like to thank Adrienne Kaeppler and Jacob Love for sharing their expertise on Samoa. 3 Autobiographical interview, unpaginated typescript, 1997, Dorr Bothwell Papers, Archives of American Art, Smithsonian Institution (hereafter Bothwell Papers). 5 Autobiographical interview, Bothwell Papers. 6 Dorr Bothwell, diary, April 19, 1928, Bothwell Papers. 8 October 18, 1928, Bothwell Papers. 9 Autobiographical interview, Bothwell Papers. 10 June 14, 1928, Bothwell Papers. 11 Bothwell diary, [October 10, 1928], Bothwell Papers. 12 Dorr Bothwell, “Notes on Modern Samoan Siapo,” n.d. (ca. 1929). Bishop Museum, Hawaii. 13 Bothwell diary, December 5, 1928. 14 Advertisement, June 11, 1930, Bothwell Papers; Display Advertisement, Los Angeles Times, November 28, 1931, A8; Myra Nye, Club Notes, Los Angeles Times, January 24, 1932; “Artist Wins Samoan Hearts: Chief ’s Foster-Daughter Will Lecture,” Los Angeles Times January 5, 1933, A2.